...is a long life utility-scaled renewable energy storage system. From our Micro System 15kW/40kWh Units to our Grid System 1MW/3MWh Units, Agriculture Solar™ is focused on the development of sustainable energy storage solutions for smart grid applications that require demanding performance and reduced economic payback periods. Agriculture Solar™ is committed to providing the "greenest" battery technology using zinc chemistry, which is abundant, inexpensive and environmentally friendly. Agriculture Solar™ is productizing grid-scale energy storage and power system technology to provide the next generation of energy storage systems for smart grid applications with the integration of wind & solar energy and other renewable generation. Agriculture Solar™ has a proprietary innovation that can be used to meet the energy storage needs of utilities, electric vehicles, the military, and major industrial and individual commercial companies. The zinc battery is based on our team's patent-pending chemistry and systems that lead to fundamentally lower cost energy storage and power system with superior performance. No toxic chemistries are used within the system for inherent safety. There are no hazardous materials to abate or segregate. Systems are certified to meet or exceed all appropriate safety and serviceability standards. Unit modularity allows easy scaling for required output power from kW to MW of service with single phase configurations at 120/240 VAC, to 15, 30, and 45 kW three phase configurations at 208 VAC. The system is capable of discharge times of up to six hours at full power. Scalability from kW to MW covers a wide range of applications that include Renewables, Commercial & Industrials, and Community Energy Systems. An option to connect directly to the DC bus enables higher levels of integration and is particularly well suited for customer-defined converter systems. The advanced control system enables a broad range of applications critical to generating revenues for shorter payback periods. Ethernet options enable connections for remote operation, control, and dialogists to reduce operation costs. We use field proven components and ISO certified manufacturing to ensure quality and reliability. System components are reusable and recyclable. 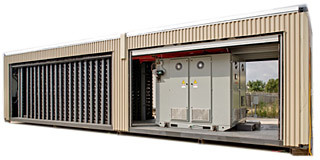 The energy storage and power system is designed for low operational costs. There is a standard one year service and warranty, extendable to 20 years. All components are designed for maximum reliability and 20 year serviceable life. There is an easy access door for routine servicing. Standard installation support is included and the system is designed for fork lift and sling transportation and installation. Uptime guarantees and service contracts for up to 20 years are available. Annual software updates service options. In addition to modular configuration options, there are discharge time options of four and six hours. Additional options include: Remote monitoring and control, climate controls, power metering, gateway for Ethernet / Wi-Fi module 10/100 Base-T or 802.11 b/g, graphical interactive monitoring software.